Described as simply outstanding, Macarthur Park Wedding Gardens is located one street off Finucane Road at 21/29 Macarthur Street, Alexandra Hills. The very unique private and secluded Australian themed gardens are set on four acres and provide a relaxed and tranquil ambience for your wedding. 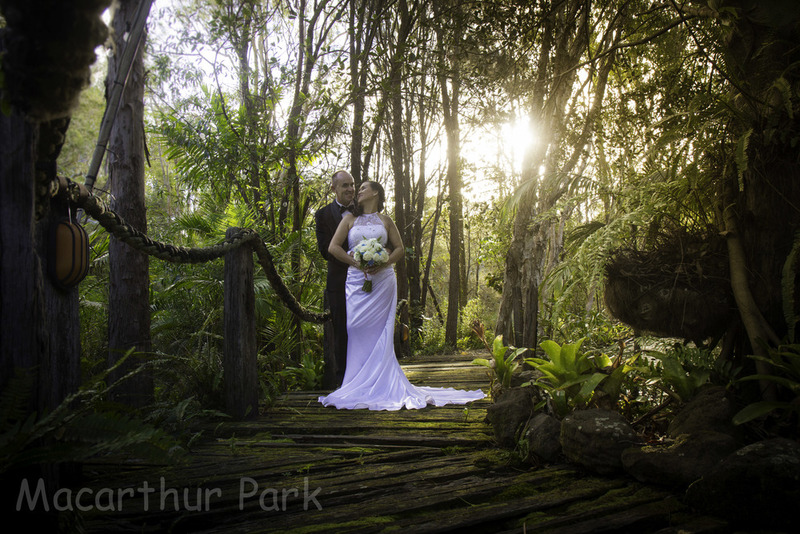 Over the past ten years Macarthur Park Wedding Gardens has become the premier wedding Ceremony Venue for the Redlands and Brisbane area alike. Macarthur Park is proud to provide a home to an amazing variety of native animals including many of our Australian icons such as the koala, wallabies, kookaburras, possums, bandicoots and turtles to name but a few. At Macarthur Park each bride is assured total privacy on her special day. We guarantee only one wedding will be conducted at any one time. This provides your wedding party absolute use of the gardens for photos. Whilst the Bridal Party participates in photographs the guests will be relaxing and enjoying the ambience of the lush surroundings. We have two striking options for your wedding ceremony. You may choose to marry in our beautifully restored 96 year old non religious, non denominational air-conditioned Chapel or outdoors on the Pier and decked area overlooking the lagoon covered with water lilies and featuring a large fountain. Various gum trees including Paperbarks line the perimeter of the lagoon providing the perfect scenic backdrop for your open air wedding. Various gum trees including Paperbarks line the perimeter of the lagoon providing the perfect scenic backdrop for your open air wedding. Throughout the property you will find many Aussie themes including the Windmill at the decked area and the Swagman's Shack located poolside. Throughout the property you will find many Aussie themes including the Windmill at the decked area and the Swagman's Shack located poolside.